How do you get London placemaking right? The more acute the need for London to grow in the right ways, the more barren the political response so often feels. From the Right comes the conservatism of faith in market forces to meet all demands and needs, too often heedless of damage done to neighbourhood ecologies and holes torn in social fabric. From the Left comes the conservatism of defending a status quo in which more and more people who struggle to get by live in temporary, poor quality or overcrowded housing in places stuck in economic decline. Ideologues seem to dominate the housing and wider development debate in the capital: rigid, impractical and frequently deaf to the desires of the very people whose interests they claim to represent. Last week’s annual Alan Cherry debate, organised by Countryside Properties and Future of London, addressed the impacts of urban regeneration and how to measure what they are. Like “placemaking”, the word “regeneration” can often resemble a euphemism for things being done to people and their piece of the city against their will, in the interests of profit and power alone. Funny finances, bogus consultations and a perverse insistence that the poor and dependent can be made affluent and self-sufficient by knocking down their homes and having them live next door to someone more middle-class have given redevelopment projects a bad name, too often deserved. Yet the alternative of doing next to nothing, whether out of dogma or because it is just too difficult to try, is less and less an acceptable option. How do you ensure that regenerations are virtuous? Who decides what good placemaking is? There is no uncontentious answer to that question. There will always be winners and losers from any kind of physical neighbourhood change, and responses to it will vary not only according to individual circumstances but also to temperaments and tastes. One resident’s welcome and exciting transformation will always be another’s distressing and destructive disruption. Meanwhile, Nimbyism is as much a feature of London life as it is of small towns and villages, albeit sometimes waving different coloured flags. Debate panelist David Lunts, the highly experienced executive director of housing and land at the Greater London Authority remarked that “doing regeneration” isn’t getting any easier in the current, fraught climate. Jackie Sadek, an erstwhile government adviser and chief executive of UK Regeneration, observed, not for the first time, that the biggest names of the property industry are “bizarrely unique” in their indifference to the people whom their endeavours most profoundly affect. Difficult terrain. So it was good that the issues got an airing among some of the more influential figures in the sector. There there also two placemaking awards announced, one for Outstanding Contribution over ten or more years, the other for One To Watch. I was one of the judges, a task which improved my appreciation of the skills required for the nurturing and managing of beneficial change. 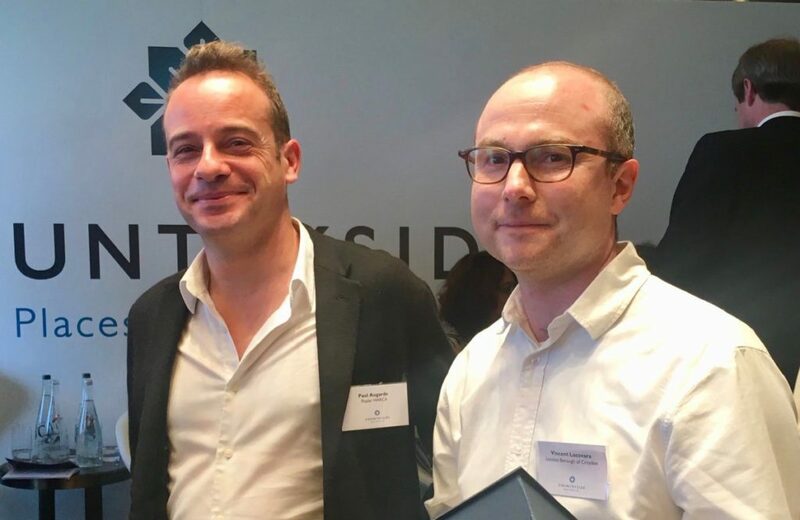 The winners were, respectively, Vincent Lacovara of Croydon Council (pictured above, right) and Paul Augarde of the Poplar HARCA housing association in Tower Hamlets (left), both of whom received impressive nominations from ranges of appreciative colleagues. The skills are out there to make London regenerations successful for the people who most need them. The trick is making sure that they are used to the full. Future of London is friend of this website, I’m pleased to say.